Ian Watson, despite a number of well-received novels to his credit, is an author with whom I am not particularly familiar. He’d come up as a British SF Masterwork on Ian Sales’ blog and, more recently, Adam Roberts has covered a few of his works on Punkadiddle. I was reliably informed that Chekhov’s Journey is an excellent example of Watson’s work, so that’s where I started. Chekhov’s Journey has three main narrative strands. The first being Anton Chekhov’s real journey to Siberia at the end of the nineteenth century, a Soviet film crew who are using a highly experimental technique to hypnotise an actor into believing that he is Anton Chekhov for a fictionalised version of this and, in the future, a crew of interplanetary colonists whose find themselves in trouble and whose spaceship appears to have caused the 1908 Tunguska explosion. Mikhail, the actor tasked with representing Chekhov, starts tapping into his life and experiences as he makes his way across Siberia. It becomes clear, though, as things are progressing that the journey he is experiencing isn’t what is remembered by history. 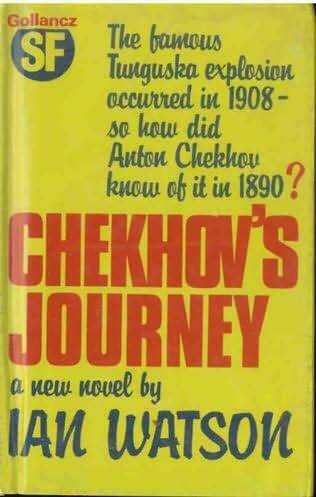 Chekhov’s journey had taken place some twenty years prior to the Tunguska Event. However, what he recalls is that Chekhov was making his way to the site of what is clearly the Tunguska explosion. More than this, he is also experiencing the events aboard a spaceship piloted by one Anton Astrov as they attempt to save themselves from hurtling back through time and destroying the spaceship and writing themselves into history as a huge explosion. Naturally, there is an air of fatality aboard the ship as they realise that they are going to be unable to prevent their fate as they already know that there was a large air-burst explosion in 1908 in the Tunguska region. There is an interesting and amusingly depicted meditation on the nature of history from the point of view of the present day Soviet film crew (remember that this novel is from 1983). It is possible, of course to bend history to different ends and, if you have sufficient control of media, re-write it entirely. As they realise what is going on with their actor, Chekhov and Tunguska, they race to find a version of history that fits with their governments ideology, the least dangerous rather than the real version. This is one of the novels many strengths, I think. A meditation on the nature of reality, coupled with questions of ideological purity, historical fidelity blended with an important literary figure (I am sort of assuming here that there’s much meta that I am missing) could lead to a serious and weighty novel. Serious books aren’t inherently bad, of course. No, this book is strong because he handles all this with a light touch and, moreover, it is genuinely funny in places. The sections following Chekhov – though I can’t say for sure how accurate they are – are well-imagined. One gets a good feel for the man and the privations of his journey. His despair at some of his work and the high esteem that some seem to have for a play that he considers little better than hack-work is an entertaining insight to a writers mind. On the subject of fiction, while on the trip to Tunguska, Chekhov’s party meets with Konstantin Tsiolkovsky (Russian rocket pioneer) who reads to them from his science fiction novel. Chekhov notes that, though the enthusiasm that he has for the subject and some of the ideas are compelling, Tsiolkovsky’s novel is hopelessly didactic and largely fails as a work of literature. This, of course, feels a lot like the discussion around the failure of a lot of SF to incorporate literary style and the giant clomping foot of nerdism. Interesting to see it being had (albeit fictionally) at the tail end of the nineteenth Century. Chekhov’s Journey is an excellent speculation on the nature of reality with an impressive handling of the role of ideology and history. Watson has produced an excellent, literate SF novel. His ideas and plotting are all first rate though it must be said that the characterisation is adequate, rather than being stellar, but that’s excusable as, though I was intermittently aware that some of the characters were a little thin, it didn’t seriously feel as though there were a gaping hole in the novel. As complaints go, this is minor. Another aspect of the novel that interested me was Watson’s look at the use of language. At times in Russian history there has been an eye cast to the west desiring to emulate what some perceived as the superior civilisation that they saw. Of course, it doesn’t do to generalise and I balk at the idea that the west could claim to be the greatest civilisation in the world when you consider the disgusting crimes committed in the name of western civilisation during the ascent of west-European empires. However, this is not about me. There was a desire amongst many to emulate the west in Russia. This was expressed in many ways. One of them being the construction of the city of St. Petersberg. In Watson’s novel, Chekhov expresses some of the inferiority felt by Russians when he is describing one of their guides. “This fellow, Tolya by name, has apparently been hanging around Kezhma for the past five or six months, doing odd jobs on what pass for farms in the vicinity instead of tramping off smartly back to his family tents deep in the wilderness. Perhaps he has been trying to become an example of Urban Man? But he looks like an Eskimo, and speaks Russian accordingly. This simultaneously condescending and cringing passage gives a little insight into a feeling which certainly existed amongst the upper classes in Russia at various times (sadly, I have no idea how far it permeated the general mass of humanity in Russia). Though Chekhov does often lament the ignorance of the average Russian villager in his letters and thoughts in the novel. The occasional use of French by some of the characters in an attempt to give themselves additional sophistication is similarly telling. Also, the realisation that Tolya’s word ‘Buga’ in his ritual (he is a witch doctor) is worryingly similar to the Russian for ‘God’. Those of you who have read A Clockwork Orange will pick up on this from the decision to use ‘Bog’ in nadsat as a word for ‘God’ which I understand is a corrupted way of saying the Russian word. Certainly that was where my understanding came from, I can claim no great understanding of the Russian language! It’s my understanding that you can see each of Watson’s novels as, loosely, part of a larger whole as he explores the nature of reality. If this is the case and all of his work is anywhere near this standard, I will certainly be looking at more of Watson’s novels. I have to confess that I am more or less completely unfamiliar with the work of Anton Chekhov himself, so I’m not quite sure how much that would add to my enjoyment of the novel. I always enjoy the meta, so I may go back to this once I rectify this oversight. However, I hope that I’ve made it clear that you can enjoy this novel without any deep appreciation of his work. Excellent, excellent stuff. I’d like to see some of this back in print. Watson’s talent is too great to be ignored. I’d forgotten about this one, but it all came back reading this. Particularly loved the hammer-and-sickle shaped Soviet time-ship (and was there ‘Captain America’s Shield’ as a US missile defence forcefield? I think Watson deserves a major re-evaluation –I go and hoke out ‘God’s World’ for a re-read. Yes! That’s one of the things I loved about this novel; there are just so many of those little details that made it wonderful. Not wanting to go too far down the ‘SF as a predictive art’ route, but it amused me a little that the SDI was announced in the same year that this was published and – as we all know – took its better known name from a well know popular culture franchise. I’ve lined up a couple of his other novels to read soonish (um, Miracle Visitors and The Jonah Kit). Looking forward to them. Great review! Again, I’m so glad that you’re bringing all these authors to our attention — Shaw, Watson, etc. This sounds quite good — and I do love Chekov, and weird Soviet films (thus, the film crew thread of the narrative sounds fascinating). Time to add this to my ever growing amazon wish list…. hahhahaa…gilo,gilo.kalo dah babi negaro babi la jadinyo.bangkai gajah tutup ngan pelopah pisang lamo lamo bau juo.takpo la jang,lopeh ni kito pakat bawak lari anak daro,kebas bini orang,rogol amah takdo eh nak tangkap do..